For the zoological taxon, see Anthropopithecus. M'Baku, in Black Panther #49. Man-Ape (M'Baku) is a fictional supervillain appearing in American comic books published by Marvel Comics. The character is depicted as a frequent enemy of the Black Panther. Winston Duke plays the character in Black Panther, and reprised the role in Avengers: Infinity War and Avengers: Endgame, set in the Marvel Cinematic Universe. He first appeared in Avengers #62 (March 1969) and was created by Roy Thomas and John Buscema. M'Baku was born in Wakanda. He became one of Wakanda's greatest warriors, second only to the Black Panther. He plotted to usurp the throne of Wakanda with the help of the outlawed rival White Gorilla Cult and return Wakanda to a primitive state. M'Baku became a renegade and gains his powers by killing a white gorilla, bathing in its blood, and eating its flesh, taking the alias of Man-Ape. He fought with the Black Panther and was believed to be dead when the Panther Totem that the Black Panther was bound to crumbled on him. He is revived by his aide N'Gamo and goes to America where the Black Panther is with the Avengers at the time. He allies himself with the original Lethal Legion made up of Grim Reaper, Living Laser, Power Man, and Swordsman. He is the first member met by the Avengers. He attacks Captain America, but is beaten back by the rest of the Avengers. He then captures the Black Panther's girlfriend Monica Lynne, binding her hand and foot with metal clamps. The Black Panther is lured into a trap and knocked out by an exploding dummy of Monica. He is chained up and meets the other members. The Legion straps him and Monica to chairs before leaving, though he is able to escape and contact the other members, before the Grim Reaper defeats him. The Legion is defeated by the Avengers after Vision overcomes Power Man and frees the other members. Man-Ape bests Black Panther again until he is defeated by Captain America. Black Panther banishes Man-Ape from Wakanda on order of execution if he returns. Man-Ape later joins a new Lethal Legion (consisting of the Grim Reaper, Black Talon, Goliath (Erik Josten's latest alias), Nekra, and Ultron-12) and battles Tigra, but abandons the Grim Reaper alongside Black Talon when the Reaper's racism became too much for him to tolerate. Man-Ape travels to uninhabited parts of the world before joining Crimson Cowl's incarnation of the Masters of Evil which is defeated by the Thunderbolts. Despite his rivalry with T'Challa, M'Baku was invited to the wedding of T'Challa and Ororo Munroe (also known as Storm of the X-Men), where he gets drunk on scotch and tries to pick a fight with Spider-Man. Man-Ape is next seen at the end of Heroes for Hire #6, teamed with Grim Reaper & Saboteur. Man-Ape is reportedly killed by Morlun: Devourer of Totems while defending his people from Morlun's attack on the Man-Ape's kingdom. But before his apparent death, he sends an envoy to Wakanda to warn them of the approaching danger. Man-Ape later appears alive as a member of Purple Man's Villains for Hire. The Man-Ape gained superhuman powers by consuming the flesh of a sacred white gorilla and bathing in white gorilla blood, enchanting him through the mystical transference of the abilities of the rare Wakandan white gorilla. M'Baku's mystically augmented powers include superhuman strength, speed, agility, stamina and durability equal to that of the mystical Wakandan white gorilla. He has extensive formal military training in hand-to-hand combat from the Wakandan Royal Militia. In the 2003–2004 intercompany crossover JLA/Avengers, Man-Ape is among the mind-controlled villains who attack the heroes as they assault Krona's Stronghold and fights Big Barda. In the Ultimate Marvel universe, M'Baku is the name of T'Challa's older brother. After the young T'Challa failed to complete the "Trial of the Black Panther", M'Baku derided him, saying that he should have taken the trial instead. Later, angry that his father had decided to share Wakanda’s technology in exchange for America’s help in saving T’Challa’s life, M'Baku left the kingdom. Man-Ape appears in The Avengers: Earth's Mightiest Heroes, voiced by Kevin Michael Richardson. In the episode "Welcome to Wakanda", he challenges T'Chaka for Wakanda's throne and kills the king in combat with some unseen help from Klaw. As Man-Ape takes the throne, T'Challa leaves to prepare to take back Wakanda from Man-Ape. With Wakanda under their control, Man-Ape and Klaw have the Wakandans' mine for Vibranium. In the episode "Panther's Quest", Man-Ape speaks with the Grim Reaper about HYDRA's Vibranium purchasing. He says if HYDRA double-crosses him, Grim Reaper won't live to regret the action. Black Panther and Captain America confront Man-Ape who sends the guards to fight instead. While Captain America fights the guards, Man-Ape ends up fighting Black Panther where Man-Ape uses a sound device given to him by Klaw. Black Panther overcomes the sound device and takes down Man-Ape, liberating Wakanda from Man-Ape's rule. M'Baku appears in Avengers: Black Panther's Quest, voiced by Ike Amadi. This version is a member of the Shadow Council and wears a force-enhancer suit that has a gorilla-like shape. In "The Panther and the Wolf", he fights Black Panther while going after the White Wolf. Winston Duke portrays M'Baku in the Marvel Cinematic Universe. 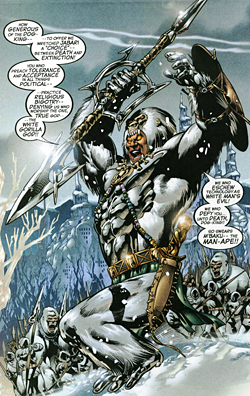 This version of the character is the leader of the renegade Jabari Tribe who choose to shun Wakanda's technological society and have a religious reverence for gorillas, such as decorating their armor with white gorilla pelts and worshipping the gorilla god Hanuman, as a part of complex Indo-African religion, rather than the Panther god Bast. M'Baku first appears in the 2018 film Black Panther. During the film's events, M'Baku challenges T'Challa for rule of Wakanda and loses while allowed to yield. M'Baku returns the favor by looking after T'Challa's grievously wounded body and agreeing to look after Ramonda. He initially declines T'Challa's request to help fight Erik Killmonger, but ultimately reconsiders and leads the Jabari into battle. During the battle, he faces off against W'Kabi and is almost trampled by the armored white rhinoceros until Okoye intervenes. Following Killmonger's death, M'Baku is later granted a place on Wakanda's national council as a reward for his aid. M'Baku next appears in Avengers: Infinity War. He joins the rest of the Wakandan army and the Avengers in battling Thanos's Outriders, and survives both the battle and Thanos's subsequent destruction of half the life in the entire universe, although many of his soldiers as well as T'Challa are killed much to his and Okoye's horror. M'Baku appears in Avengers: Endgame. Man-Ape appears as a boss for the Wakanda level in the PlayStation 2, PlayStation Portable, Nintendo DS, and Wii versions of Marvel: Ultimate Alliance 2, voiced by Emerson Franklin. In a fashion similar to his comic book origin, M'Baku leads an attack on Wakanda in a bid to usurp the throne from T'Challa whilst the country is incapacitated by a wave of hostile nanite machines caused by The Fold. Man-Ape appears as a boss and the leader of the White Gorillas in the Facebook game Marvel: Avengers Alliance. Man-Ape appears in Marvel Heroes. He appears as the boss of the one-shot story "Vibranium Mines." Man-Ape appears as a playable character in the Black Panther DLC for Lego Marvel's Avengers. Man-Ape appears as a playable character in Lego Marvel Super Heroes 2, voiced by Alexis Rodney. After Wakanda becomes part of Kang the Conqueror's makeshift city of Chronopolis, Man-Ape assists Klaw and the Hydra Four in stealing the Vibranium. He ends up defeated by Black Panther, Ms. Marvel, and Spider-Man. ^ JLA/Avengers #4. DC Comics. ^ Ultimate Captain America Annual #1. Marvel Comics. ^ "The Panther and the Wolf". Avengers Assemble. Season 5. Episode 4. October 7, 2018. Disney XD. ^ Breznican, Anthony (July 13, 2017). "How Black Panther solves the problem of M'Baku". Entertainment Weekly. Archived from the original on July 13, 2017. Retrieved July 13, 2017. ^ "Black Panther: Creating a New M'Baku". Den of Geek. Retrieved 2018-02-15. ^ Kroll, Justin (September 28, 2016). "'Black Panther' Taps 'Person of Interest' Actor Winston Duke to Play M'Baku (EXCLUSIVE)". Variety. Archived from the original on September 29, 2016. Retrieved September 28, 2016. ^ Pritchard, Tom (November 29, 2017). "Avengers: Infinity War Breakdown: Everything We Spotted in the First Trailer". Gizmodo. ^ Becker, Daniel (June 14, 2017). "LEGO Marvel Super Heroes 2 Character List From E3 Live Stream!". Bricks to Life. Retrieved July 18, 2017. This page was last edited on 25 April 2019, at 19:52 (UTC).